Pinay WAHM: Tornado...captured in Picture! I've experienced some nasty natural calamities like earthquakes [I was in Taiwan when the 1998 devastating earthquake happened], hurricane [I am in the hurricane capital of the US] and of course the ones I experienced in the Philippines. One calamity though that I don't want to even think about happening is a tornado. 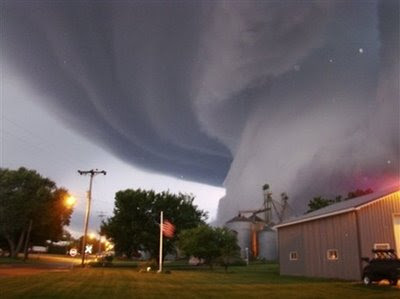 It seems tornadoes are happening a lot in past few days and I came across this picture in Yahoo of a tornado touching down during the Midwest storms last Tuesday. Look how big it is! It's scary just looking at the picture. that so scary sa isang iglap ala na ang lahat,nakapanuod me sa tv as in ala talagang natira buti nalang nabuhay pa cla yung nga lang yung mom nalumpo kc nadaganan yung paa nya kawawa nga eh taga jan sa US. anyway, malapit na tayong tumama. huwag ka mainip malapit na tayo mag kape sa castle. proceed na kasi, kaya mong tingnan yong picture! lol! hi there! thanks for visiting. wished i knew how to speak tagalog, cos my son is half filipino as well. hope i can learn and teach him. do help in this. hee hee. anyway, in malaysia there are no tornadoes so far. the worst are just tremors felt at some places. what we do have are man made flood and last 2004 tsunami at penang. that one was bad enough. goodness kakatakot nman neto..how r u?